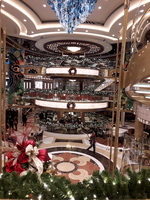 We chose this cruise to experience a reasonably new ship and to have a Christmas at sea. We overnighted in Auckland before going down to Princes Wharf about midday on the 18th. Our bags were whisked away in a flash and we then presented ourselves at Check In. As we were the first deck to load we were on the ship around 1230hrs and got our first look at the Atrium all decked out for Christmas with Carolers preparing to welcome all with Christmas cheer, We decided on a quick visit to our stateroom to dump our carryon luggage and then head off for lunch at the World Fresh Marketplace on deck 16, There was plenty to select from and we were soon replete and off to our Mini Suite (R210) on Riveria Deck (14) to unpack and meet our Stateroom Attendant Johner who looked after us very well throughout the cruise. The cruise itself was everything we expected it to be and more. (Snow in the Atrium during Christmas Carols, lovely food all over the ship, friendly helpful staff everywhere and what a beautiful ship decked out in her Christmas finery). She is indeed a beautiful ship but some small things puzzled us, like no wrap around Promenade Deck (deck 7), having to jog into and then out of the Sports court as you do laps and more could be done with the mini golf greens to make them interesting. The trek from the front of the ship to the Allegro Dining Room requires the use of more than one deck as there is no way to walk the length of the ship on deck 6. (where the Concerto and Allegro dining rooms are located). Still good for the digestion I guess. These things should not detract from the ship as a whole. She is indeed a Majestic Princess. We were located in the Allegro dining room (Tradional Dining) and were looked after by Elvie and Roy. Elvie is the consumate professional. She is vivacious and funny and we didn&apos;t just eat there; we were entertained and enjoyed every moment of it. Roy is a shy young man, but very friendly and efficient and looked after us well. They were a great team. As for our Stateroom it was excellent even for three people. The only small problem was that the curtains which divide the room didn&apos;t mearly meet in the middle. It was kept clean and tidy throughout the cruise. The entertainment on this cruise was absolutely first class, from the shows in the Princess Theater, the entertainment in the Atrium and of course the other bars and showrooms although we didn&apos;t spend much time in these. The Cruise Director was efficient, funny and had the ships entertainment running like clockwork. He even ran a Christmas Church service which was well attended. 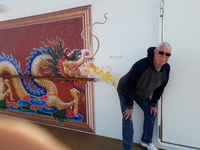 I think this is all I need to say about this cruise. I do however have to mention the disembarkation in Sydney. It was smooth, rapid and we were in a Taxi heading for our accommodation in a most timely manner. Top points for this. 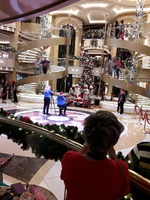 We chose this cruise to experience a reasonably new ship and to have a Christmas at sea. We overnighted in Auckland before going down to Princes Wharf about midday on the 18th. Our bags were whisked away in a flash and we then presented ourselves at Check In. As we were the first deck to load we were on the ship around 1230hrs and got our first look at the Atrium all decked out for Christmas with Carolers preparing to welcome all with Christmas cheer, We decided on a quick visit to our stateroom to dump our carryon luggage and then head off for lunch at the World Fresh Marketplace on deck 16, There was plenty to select from and we were soon replete and off to our Mini Suite (R210) on Riveria Deck (14) to unpack and meet our Stateroom Attendant Johner who looked after us very well throughout the cruise. The cruise itself was everything we expected it to be and more. (Snow in the Atrium during Christmas Carols, lovely food all over the ship, friendly helpful staff everywhere and what a beautiful ship decked out in her Christmas finery). She is indeed a beautiful ship but some small things puzzled us, like no wrap around Promenade Deck (deck 7), having to jog into and then out of the Sports court as you do laps and more could be done with the mini golf greens to make them interesting. The trek from the front of the ship to the Allegro Dining Room requires the use of more than one deck as there is no way to walk the length of the ship on deck 6. (where the Concerto and Allegro dining rooms are located). Still good for the digestion I guess. These things should not detract from the ship as a whole. She is indeed a Majestic Princess. We were located in the Allegro dining room (Tradional Dining) and were looked after by Elvie and Roy. Elvie is the consumate professional. She is vivacious and funny and we didn&apos;t just eat there; we were entertained and enjoyed every moment of it. Roy is a shy young man, but very friendly and efficient and looked after us well. They were a great team. As for our Stateroom it was excellent even for three people. The only small problem was that the curtains which divide the room didn&apos;t mearly meet in the middle. It was kept clean and tidy throughout the cruise. The entertainment on this cruise was absolutely first class, from the shows in the Princess Theater, the entertainment in the Atrium and of course the other bars and showrooms although we didn&apos;t spend much time in these. The Cruise Director was efficient, funny and had the ships entertainment running like clockwork. He even ran a Christmas Church service which was well attended. I think this is all I need to say about this cruise. I do however have to mention the disembarkation in Sydney. It was smooth, rapid and we were in a Taxi heading for our accommodation in a most timely manner. Top points for this.